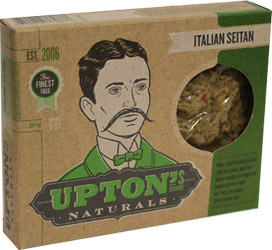 Seitan is usually pretty bland unless you season it yourself, but Upton’s has changed the game with their delicious wheat gluten crumbles! Just heat and serve to get these tasty meal helpers ready for your feast – they’re tasty on their own, but are the perfect base for making your own dishes. Each package contains 8 oz. (227g) of tasty seitan crumbles, and are available in three flavors: Italian Sausage, Ground Beef and Chorizo. $3.99 per package. Chorizo ingredients: Water, Vital Wheat Gluten, Soy Sauce (Water, Wheat, Soybeans, Salt), Apple Cider Vinegar, Garlic, Guajillo, Oregano, Sea Salt, Onion Cumin, Black Pepper. Ground Beef ingredients: Water, Vital Wheat Gluten, Soy Sauce (Water, Wheat, Soybeans, Salt), Whote Wheat Flour, Garlic, Sea Salt, Onion, Oregano, Black Pepper. From ChefMike of Clearlake, California on 6/24/2018 . This is an EXCELLENT product! You truly cannot tell the difference. I have been a Chef for over 45 years and I'm impressed! From Janet Hein of YUBA CITY, California on 12/27/2016 . From Angela Dowdell of Ashland, Ohio on 8/31/2015 . I ordered three packages of this seitan, two of which were just fine and tasty. The other was RANCID. It was well before the expiration date, not sure what happened. That is my only experience with this company, so I've no idea if its a common issue. From ashades of Keyport, New Jersey on 4/1/2015 . Was excited to try the Italian seitan. It was disgusting. The texture was like old ground beef that was in the refrig too long. They used two spices that conflicted with each other fennel and oregano. My husband and I both thought it was disgusting in texture and taste. I picked every piece out and pitched it into my compost. It ruined my yummy dinner.